I love listening to some of the NPR shows like This American Life. The topics and stories they come up with fascinate me, especially since they are usually about the lives of ordinary people like you and me. StoryCorps is another project that NPR has done, which gives people the opportunity to record an interview with someone in their lives. The interview is then preserved at the Library of Congress, and many of them are also broadcast on NPR's StoryCorps podcast. 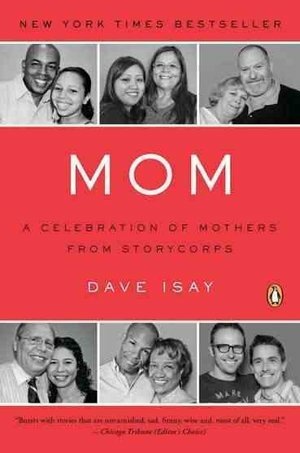 The book I am reviewing today--Mom by Dave Isay--is actually a written collection of many of these StoryCorps interviews. All having to do with motherhood. The stories are divided into three categories: Wisdom, Devotion and Enduring Love. All things that most mothers are known for. So many different stories of motherhood are represented, and each of them touched me somehow. Some were amusing, others were faith-building. There are stories of adoptive mothers and biological mothers and mothers of quintuplets. There are interviews between siblings, parents, children, friends, etc. And I learned from each one. Each story is rarely more than a few pages long, and this is a book that is wonderful to keep by your bed to read a few chapters whenever you're feeling in need of a pick-me-up. It would also be a great gift for Mother's Day, which is coming up next week. I also enjoyed how the end of the book has sample interview questions, should you want to create your own interview with somebody important to you. I know we did something similar with my grandparents before they died, and the resulting video has been treasured. The publisher has kindly agreed to give a copy of this book to one of my readers. Just comment on this post and tell me something about your own mother that you never want to forget. This book was sent to me by the publisher via TLC Booktours. Also, the giveaway for When Did I Get Like This? is still running. Don't forget to enter to win that book, too! I never want to forget how much my mother taught me to be my own person and stand by my opinions -- especially the ones that I've formulated based on good information and research. Be informed and be involved -- she always has been both, and I strive to follow her example. And "This American Life" podcasts get me through many a late night of bookkeeping. My mom is very devoted to all of us. She always went to every concert, performance of what ever we were in. Even now, my 32 year old brother was in the Mesa Easter Pagent and she went every nite. My own mother...I could write a book on her. She's amazing, and kind, and openhearted, and funny. Best story lately is that my little brother was just called as bishop of his ward. When he called my mom to tell her, she laughed and laughed and laughed and laughed. He told the story over the pulpit the day he was ordained and she was a little embarrassed, but then she laughed. Hilary: I KNOW! Lara reads more books in a month than I read in six!! Voracious, I tell you! But, I, too, love This American Life. Lots of great stories. When Lara and I were little, we used to get together and read books all the time -- not the typical "play date", but it was so nice to have a reading friend. I'm glad that you are still a reader, Lara -- I just wish that we could still ride our bikes to the library. Something that I shall always connect with my mom is how she worked her faith and testimony into everyday conversations -- it seemed like the most natural thing in the world. I never want to forget that my mother did the best she could do with her very limited resources. My mother, your grandmother, was one of great strength in the face of adversity. SHe always picked herself up and did what had to be done! She also, was always there when we had problems, to love and support and help when necessary. I miss her very much. I love the fact that there are interview questions in the back of this one! We've interviewed my grandparents many times (they are now 93 and 87) and those are videos my entire family treasures. Thanks so much for being on this tour. I'm glad you enjoyed reading these stories! I'll never forget my mom's smile. It was that indelible. I love This American Life. My very favorite among my most favorite things, minus my family.